Electric Hoist Market size was valued over USD 1.9 billion in 2017, and the industry will grow at a CAGR of upto 7.3% up to 2025. A hoist is a device used for lifting materials, consisting of either a rope or a chain around its wheel or drum lift, with a hook for attaching the payload. An electric hoist can lift and relocate heavy materials easily, thus enabling the operators to shift the items efficiently and comfortably from one place to another. The electric hoists demand is likely to grow over the forecast period as it highly reduces labor costs and operational time. Electric chain and wire hoist is extensively used in manufacturing, construction, marine, logistics, and in other major end-users. Factors responsible for the product demand are high reliability, efficient performance, and very low failure rates are predicted to boost the growth of electric chain and wire hoist market over the next years. High growth in new and retrofit construction activities in BRIC nations has driven the construction industry rapidly. With new projects and development plans, the use of construction equipment is also expected to grow proportionally. In construction activities, the overhead cranes are majorly used owing to their performance, reliability, and strength. Along with cranes, hoists play a key role in transportation of materials in construction sites. The electric hoist market is further led by automotive industry, which grows at a considerable growth rate during the projected period. For instance, the global automotive manufacturing in 2017 was close to 96 million units and this figure is likely to observe strong growth over the forecast timeframe due to improving socio economic factors such as consumer lifestyle and escalating spending power. The electric chain and wire hoists are responsible for maneuvering, transporting, and conveying, of materials through one place to another. The primary restraint of the electric hoist market is the lack of skilled manpower to operate both cranes and hoists. The demand for skilled operators has been significantly increasing over the years. Most end-users may witness a scarcity of qualified maintenance staff and engineers to properly maintain and support the material handling equipment. The electric wire hoists market held the largest revenue share of over 80% share in 2017. Wire hoists can be changed according to the load capacity and are electrically powered. These are mounted on the bridge beam of an overhead crane with the help of a trolley. Wire hoists are majorly used in the manufacturing environment, as they provide efficient lifting capacity and faster lifting time. In terms of load bearing capacity (in tons), the chain hoists are segmented as 0.25 - 5.0, 5.1 - 10.0, 10.1 - 15.0, 15.1 - 20.0, and 20.1 - 32.0. Among all these, 0.25 - 5.0, and 5.1 - 10.0 load ranges are predicted to have the highest share of global electric chain hoist market and are expected to grow at a CAGR’s over 7.0% and 7.4% respectively. In terms of load bearing capacity (in tons), the wire hoists are segmented into 0.5 - 10.0, 10.1 - 15.0, and 15.1 - 20.0 tons. Among all these, 0.5 - 10.0, load range hoists are expected to hold the highest share of the global electric wire hoist market and are predicted to grow at a CAGR over 7.3% over the entire forecast period. In terms of end-user, the electric hoist market has been segmented into aerospace, automotive & transportation, construction, energy, marine, and others. Automotive & transportation segment had a significant market share of over 20% in 2017 and will significantly grow till the end of the forecast period. 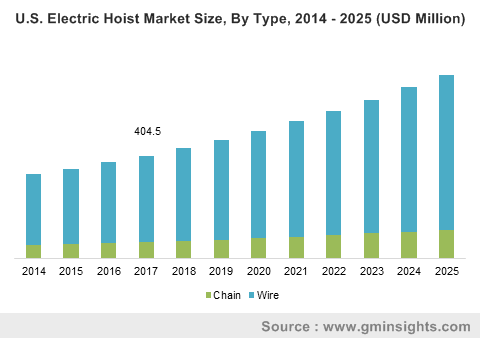 Increasing automotive production in both developed and developing economies is positively impacting the growth of global electric hoist market till the end of 2025. Asia Pacific electric hoist market held a significant share in 2017 and is predicted to lead the global market over the forecast period. The Asia Pacific regional market growth is primarily attributed to increasing expenditure for the development of infrastructure activities, particularly in highly developing nations such as India, and China. Also, increasing urbanization activities, are also likely to be the key factors accelerating the electric hoists’ demand over the coming years. 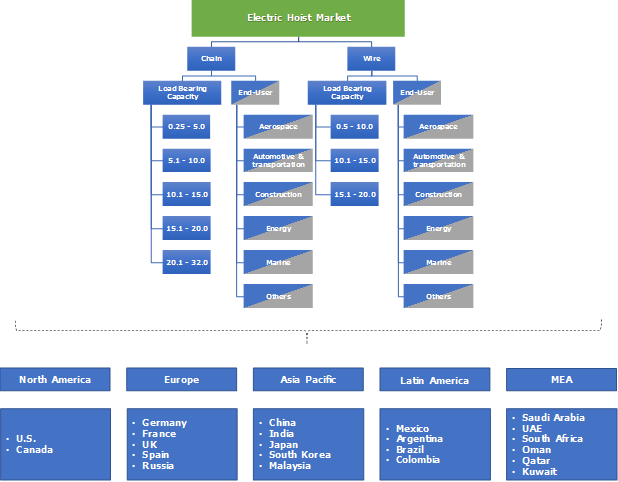 North America electric hoist market had the second largest share, which is likely to increase at a prosperous growth rate of over 7.5% over the entire forecast period attributed to increasing industrialization. The global electric hoist industry is competitive because of the presence of many major and global players. Some key companies profiled in this market include Ingersoll-Rand plc, Konecranes Oyj, Columbus McKinnon, Hitachi Industrial Equipment Systems Co., Ltd., KITO Group, Komatsu Ltd., Reva Industries Ltd., SIGMA Hoist Company Pvt. Ltd., Harrington Hoists, Inc., Beta Max Hoist, Terex Corporation, ABUS Kransysteme GmbH, Liftking, and SWF Krantechnik GmbH among others. Key electric hoist market share contributors are expanding their business horizon through strategic mergers & acquisitions. For instance, Liftking Manufacturing Corp declared that it would acquire product assets and intellectual property of Omega Lift in November 2016. CMCO acquired STAHL and further increased its product penetration in Europe, North America, and Asia Pacific. The global electric hoist market had witnessed a high growth over the past years. Asia Pacific dominated the global market as a major shareholder and will continue its dominance till the end of 2025. Robust growth indicators in the end-user industries including construction, automotive, etc. has positively impacted in the industry size in the recent years. For instance, numerous residential construction projects in APAC countries including India along with government initiatives to upgrade their public infrastructure will propel product demand for easy and swift material handling applications.